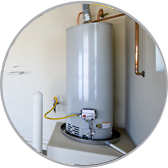 We offer Water Heater Replacement in San Tan Valley, AZ. Nothing really compares with the devastation you feel when your water heater bursts or leaks from the bottom, covering your floors with water and leaving you without the means to bathe, shower, complete laundry, or do dishes. The water heater has no respect for your time either, often failing late at night or on a holiday or weekend. When your heater breaks it is important to find a reliable plumbing and home services company that can get to your home fast and guide you through the steps needed to remove the failed heater and replace it, to local codes, with a new model. We know how essential a properly working water heater is to your family. And we also understand you are dealing with the need for a water heater replacement in San Tan Valley, AZ.t at a stressful time if you are faced with a completely failed unit. Our professional and compassionate technicians walk you through the process patiently, answering all the questions you have and offering you a range of affordable options. Expect us to ask about your hot water usage and any changes you anticipate soon so we can recommend the proper capacity and heater design for your needs. Our technicians are fully certified and licensed to both remove the old heater and install your new one. If we need to alter anything in your home to bring the new installation up to local codes we will explain what we are doing completely. If the technician does not have an answer for you immediately a call will be made to clarify matters so you are comfortable with the efforts we are making on your behalf. All charges to you will be clear and detailed for your review. Our office can discuss payment options with you at any time during the process. We want you to be happy with your water heater replacement in San Tan Valley, AZ.